Generally recognised as the most popular game music composer, Nobuo Uematsu came to attention while scoring Square’s Final Fantasy series and has, more recently, pursued a diverse freelance career. Born on March 21, 1959 in Kochi, Uematsu enjoyed music from a young age and considered Elton John an idol. While never formally educated, he taught himself how to play his grandparent’s guitar and sister’s piano from the age of 12, using nothing but his ear and some enigmatic songbooks for inspiration. When he entered junior high school, the artist developed a taste for the British progressive rock movement — finding it fascinating how artists blended such emotional sounds from a rock basis — while still listening to a range of pop music. He went on to form an amateur band with three school friends, writing music for over a hundred songs from lyrics he received; like most his subsequent compositions, he focused on creating simple but emotional melodies and showed more influence from Western than Japanese movements. While these were humble beginnings, his performances still managed to entertain small crowds at several local gigs. Music had become Uematsu’s primary passion. Uematsu subsequently studied a non-musical degree at the Kanagawa University and met his future wife Reiko. After graduating in 1981, he realized he needed a stable income to marry his partner and started working part-time at a music rental company. He enjoyed drinking beers with his friends there, and often contemplated his future with them without knowing what his steps were. One of his dreams was to create intimate and memorable music for European-styled films, but he never considered working in the still archaic games industry. As time went by, Uematsu continued to perform in various amateur bands and create music for some commercials, but still struggled financially. Noticing his musical talent, a girl he met at the rental company — who had been taken on at the art department of Square — encouraged him to create some music for the company’s titles. Following a premonition by a fortune teller, he had a chance meeting with designer Hironobu Sakaguchi in 1985 and agreed to create music for his games on the side. At that time, the company was still a struggling collective of hobbyists, working from a computer café, but Uematsu felt inspired by its designer’s vision and confidence. Uematsu has noted that his first few years working for Square were not easy, given the company struggled to generate a hit in Japan’s increasingly crowded video game market. In his first role, he created a handful of compositions for the PC-8801 title Cruise Chaser Blassty. On this title, he adapted his rock-flavoured style to match the science-fiction tone of the game and carefully implemented the music with PSG synth. He subsequently complemented the image of various other computer titles with impressive central themes — spanning the gothic Genesis, ominous Aliens, and girly Alpha — but never enjoyed widespread recognition. Taking a few step backwards technologically, he later worked on some NES titles that were localised overseas. 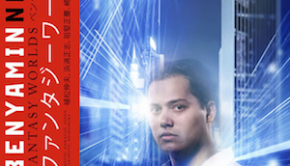 He motivated listeners with upbeat chiptunes on 3D Worldrunner and JJ, between creating a fast-paced funky score for Rad Racer and a heroic accompaniment to King’s Knight. Also in 1987, he was also responsible for three scores on the Famicom Disc System, namely Cleopatra’s Cursed Treasure, Appletown Story, and Tokimeki High School. Published by the Nintendo, the latter was a historic bishoujo game featuring pop idol Miho Nakayama. Despite featuring ambitious concepts and scores, few of these titles recouped their development costs on publishing. After this underwhelming start, Uematsu made his popular breakthrough during Christmas 1987. While facing bankruptcy, Sakaguchi decided to make one more game for the title, an RPG inspired by the commercially successful Dragon Quest. The success or failure of this turbulent project would likely determine the fate of the company, hence its title Final Fantasy. The game was, of course, a huge genre-redefining hit thanks to its creator’s inspiration and promotion. While a collaboration with a Japanese band was considered, Uematsu was ultimately responsible for the entire score. Using Hironobu Sakaguchi’s briefings and Yoshitaka Amano’s artwork for inspirations, Uematsu created a range of music that fitted the game’s settings, battles, and menus. He placed an emphasis on strong heartfelt melodies throughout — inspired in part by Koji Kondo’s Super Mario Bros. and Koichi Sugiyama’s Dragon Quest — while also portraying the magical element of the game with staples such as the arpeggiated prelude and an assortment of sound effects. He persevered to overcome the numerous technical restrictions imposed by the NES’ three channels and memory limitations, but otherwise felt creatively liberated throughout the project. While the score was the series’ most brief and modest, it was fondly remembered by those who played the game. With Square secure thanks to the financial success of Final Fantasy, Uematsu was taken on as a full-time composer at their new headquarters in 1987. Soon enough, he started work on Final Fantasy II, creating a score that built on its predecessor in several ways. He focused on contrasting the title’s armies and portraying several mystical locations, while also propelling some mainstays such as the hummable Chocobo theme. Aware of the popularity of the series’ music, he compiled his two Final Fantasy scores with bonus arrangements into the album release All Sounds of Final Fantasy I & II for CD, tape, and vinyl. Inspired by the precedent of Dragon Quest, the Tokyo Symphony Orchestra also performed a symphonic adaptation of the scores at a special concert in 1989. Uematsu found it extremely nerve-racking to produce such a momentous event, but was relieved by the reception. The event inspired even Koichi Sugiyama’s attention and set precedent to a series of concert adaptation and arranged albums popularising Final Fantasy music. Uematsu also scored a couple of experimental RPGs between such productions, demonstrating his light-hearted humorous personality on Hanjuku Hero before taking a more scenic approach on the novel adaptation Square’s Tom Sawyer. In 1989, Uematsu established the musical foundations of Akitoshi Kawazu’s SaGa franchise. On the title’s first instalment, he accommodated the technical restrictions and stereo sound of the Game Boy while offering several memorable RPG themes. He subsequently composed half of SaGa 2: The Treasure Legend, mixing arrangements of mainstays such as “The Legend Begins” and “Wipe Your Tears Away” with new compositions, before creating a synthesizer medley for the trilogy’s album release. As the company’s scores were growing more expansive and detailed, Uematsu decided it was no longer possible for him to score all of Square’s titles. Between 1990 and 1992, he took on composers Kenji Ito and Hiroki Kikuta, sound programmer Minoru Akao, and a team of sound designers to develop further titles. Now leader of a sound team, Uematsu — barely in his 30s — decided to grow his trademark moustache alongside Sakaguchi to command more authority. Able to dedicate his composing time to the Final Fantasy franchise, he wrote some 44 pieces for 1990’s Final Fantasy III. Wanting to prove that he could create more complex music too, he also produced the album Final Fantasy III: Legend of Eternal Wind, mixing medley arrangements with original vocal themes and epic narration. Embracing the opportunities of the Super Nintendo, Uematsu subsequently created the entire score for Final Fantasy IV. He found the project went extremely smoothly and, with his company having set up a second headquarters in Hawaii, he particularly enjoyed being able to compose from an office overlooking the beach. Fuelled by the more elaborate scenario, he portrayed the personalities and emotions of the game’s characters with several evocative themes. He also produced more fleshed-out depictions of the game’s settings to support the richer visuals and elaborated on his popular battle theme approach for several boss encounters. With the series becoming increasingly marketable, Uematsu worked closely with NTT Publishing producer Kensuke Matsushita to adapt the score into a Celtic-themed arranged album, piano collection, and promotional single. Uematsu’s approach on Final Fantasy V was more ambitious once again — fondly remembered in Japan for emotional explorations such as “Dear Friends” and rocking action themes such as “Clash on the Big Bridge” — and he personally arranged a selection of favourites for the album Final Fantasy V: Dear Friends. But despite these developments, he ensured that his music was still accessible and sincere — placing a focus on strong melodies that could speak for themselves above everything else. Looking back at his works, Uematsu considers 1994’s Final Fantasy VI his favourite project and score. He notes that there was an amazing amount of teamwork with the 30 person team and invested so much emotion into the project that he cried when Sakaguchi gave a speech at its launch party. Treating the score as an ending point for him, he created numerous memorable and emotional pieces to enhance the game. Most notably, the score featured several extended setpieces, including a classically-inspired opera sequence, a four-tiered organ piece to represent the metamorphosis of the final boss, and a gigantic ending theme featuring nostalgic arrangements of every character theme. With Final Fantasy becoming a worldwide phenomenon, Uematsu’s music from the game was commemorated with a three disc soundtrack release in both Japan and North America, while also forming the basis of arranged albums for orchestra and piano. At the request of his mentor Koichi Sugiyama, he was delighted to attend a 23 minute adaptation of the game’s opera sequence at the fourth Orchestral Game Concert. Uematsu also agreed for his music Final Fantasy’s Nintendo generation to be adapted into two vocal collections, a remix collection, and a compilation. After completing Final Fantasy VI, Uematsu spent six months penning his first solo album Phantasmagoria at the request of NTT Publishing. 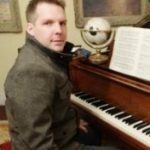 Having created so many intense and diverse game soundtracks, he focused on communicating music to relax and heal minds. Having long considered music a universal language, he notes that “people from all over the world can appreciate the same song and this brings some peace between people”. Featuring a range of synthetic instrumental tracks and hypnotic voice pieces, the album fittingly closed with a special vocal arrangement of the Final Fantasy series’ main theme. Returning to his main scoring duties, Uematsu closed the Super Nintendo era three other scores. 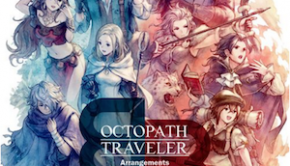 He returned from vacation to supplement the score for Chrono Trigger with several memorable compositions while Yasunori Mitsuda was hospitalised. He subsequently created a light-hearted accompaniment to the Satellaview’s DynamiTracer, filled with playful jazz licks and amusing voice effects. Finally, he complemented the dark tone of Omiya Soft’s Front Mission: Gun Hazard with dramatic melodies, stylish sound palettes, and loud dynamics; to his disappointment, the vast majority of the 200 pieces he created were discarded, though the remaining pieces are a distinctive addition to his discography. Deciding to continue forth with further Final Fantasy scores, Uematsu invested considerable time into scoring 1997’s Final Fantasy VII. Marking the transition from the Super Nintendo to PlayStation, Uematsu was eager to learn what could be achieved with new hardware and embrace the opportunity to experiment in new styles. He was not disappointed when he shown a rendering of the opening movie for the game by director Yoshinori Kitase. Inspired by the rich visuals, he immediately started work on a cinematic theme to contrast the planet’s natural beauty with an industrial metropolis. With his faithful Roland SC88 synthesizer by his side, he went on to create music to enhance numerous other iconic scenes in the vast game. In what has been called one of the most iconic moments in gaming, millions of players wept to Uematsu’s gentle melodies and “Aerith’s Theme” was ingrained into the general gaming consciousness. Despite never fulfilling his ambitious to create a theme song for the title, the composer made the game’s climactic battle all the more memorable with “One-Winged Angel”; experimenting with the console’s technology, he inserted the theme into the game by combining a sequenced orchestra with compressed choral performances inspired by Orff. Uematsu took an even more elaborate approach to scoring on Final Fantasy VIII. Having recruited several synthesizer operators to the sound team during the development of the title, in the final expansion of his sound team, he was able to offer more realistic and expressive orchestral samples to express his melodies. Facilitated by the streaming technology of the PlayStation and the orchestrations of Shiro Hamaguchi, he was even able to integrate full orchestra and chorus performances into the momentous opening and extended ending sequences. To support the romantic storyline, he also recorded a love ballad with Faye Wong, “Eyes on Me”, that sold half a million copies and won an eminent award. Following this epic and futuristic score, he reverted to a more personal and traditional approach on the simultaneously developed Final Fantasy IX. The 150 track score was particularly influenced by his explorations of music from other countries and eras during his personal time. Highlights included the ancient instrument performances on “A Place to the Call Home”, Spanish guitar stylings of “Vamo Alla Flamenco”, impressionistic wanderings of “Bran Bal”, and nostalgic lyrical lines of “Melodies of Life”. However, he ensured his personal melody-driven approach to game scoring remained consistent throughout. Between 1998 and 2001, Uematsu also worked on several other non-game productions. As a producer of the concept vocal albums Ten Plants and Ten Plants: Children’s Songs, Uematsu brought together numerous composers from different companies. It was one of the first albums of its kind in the game music field and inspired various successors. In other vocal productions, Uematsu supplemented two original albums, Emiko Shiratori’s Cross My Heart, RIKKI’s Honey, and elva’s self-titled debut, with new pieces; while they never became as well-known as the Final Fantasy’s ballads, they further reflected Uematsu’s ability to connect with people through vocal melodies. Wanting to further challenge himself, he went on to contribute emotional theme songs and several instrumental compositions to the animes Ah! My Goddess and Final Fantasy: Unlimited; he worked closely with lead composer and orchestrator Shiro Hamaguchi to ensure they fitted intimately into the final scenes. Hironobu Sakaguchi also requested that he compose either a full score or theme song for the feature film Final Fantasy: The Spirits Within, but he lacked the time to commit. He realized that, while it was once his dream to score films, he prefers the freedom that game scoring offers to composer and player alike. In 2001, Uematsu headlined the score for the PlayStation 2’s Final Fantasy X. As the game incorporated voice acting and stereo sound, the composer took a more subdued and cinematic approach to the music. Motivated by the game’s rich scenario, he nevertheless produced several defining themes that were extensively arranged through the game. In a series of firsts, he arranged his first solo piano piece for the tear jerking opening, wrote a modal hymn that was incorporated into the story, and instilled an Okiniwan flavour to the theme song “Suteki da ne”. Physically exhausted from late nights and distracted by development meetings, the composer was nevertheless unable to compose at the pace and quality necessary to meet the score’s deadline. He therefore requested composing assistance for the first time in the series — selecting Masashi Hamauzu and Junya Nakano, who he felt long deserve the opportunity to come to the spotlight. While developing the title, he also revisited his classic Final Fantasy scores featured on several compilations. The ports of the series’ Super Nintendo titles were supplemented with new opening and ending themes, while the remake of Final Fantasy was enhanced with richly styled arrangements and new battle themes. In 2002, Uematsu was excited to attend the orchestral concert 20020220 — Music from Final Fantasy, the first dedicated to the series in over a decade. The concert featured orchestrations of favourites across the series performed by the Tokyo Philharmonic Orchestra to a sold-out crowd. Having become the much-loved face of Final Fantasy music, Uematsu was overwhelmed by the fan reception at the event. The composer subsequently attended presentations of the series’ music at two commercially and critically successful tours. Tour de Japon — Music from Final Fantasy was a series of seven concerts in six cities across Japan featuring several exclusive symphonic arrangements. Dear Friends — Music from Final Fantasy brought favourites such as “To Zanarkand”, “One-Winged Angel”, and “Theme of Love” to equally eager audiences in North America for the first time. The series’ music also debuted in Europe at the First Symphonic Game Music Concert and Australia at A Night in Fantasia 2004 with the composer in attendance. Though the pieces performed at each concert tended to stay the same, hearing them live and receiving the opportunity to meet or see Uematsu was a big enough thrill that thousands of fans flocked to their esteemed venues. Uematsu also helped to developed Final Fantasy’s discography by preparing numerous soundtrack releases, arranged albums, vocal singles, and compilations released by DigiCube. As an employee, he did not own or profit from the music that he created and felt slightly exploited by his employer’s increasingly commercialistic tactics. Nevertheless, he felt most productions were natural ones in response to fan demand and particularly enjoyed recording albums such as the Final Fantasy VII Piano Collections and Final Fantasy Song Book Mahoroba. He also felt enthusiastic about Tsuyoshi Sekito and Kenichiro Fukui’s attempts to produce a rock album dedicated to Final Fantasy battle themes; he felt that, despite the series’ increasing reputation for orchestral approaches, he remained a rock musician at heart and wanted to convey this to world. He subsequently led a six-piece band, known as The Black Mages, into gloriously received concerts at Tokyo and Kanagawa during 2003. He took an active role planning and performing the band’s challenging second album and accompanying concerts, before making a series of guest appearances at other events. The concerts were certainly a welcome departure from the middle-aged business man’s office duties and he released their DVD recordings to his official fan club. During his final years as an in-house employee, Uematsu worked on numerous projects. He headlined the score for Final Fantasy XI with several major themes, otherwise scored under his supervision by Naoshi Mizuta and Kumi Tanioka; most notably, he wrote the epic opening theme for Esperanto chorus to symbolise connecting people across the world through the MMORPG. He subsequently revisited his earliest days at the company on Hanjuku Hero VS 3D — offering numerous light-hearted tracks rendered in 8-bit synth and two hilarious anime-styled theme songs — before creating the frivolous main theme for Final Fantasy Tactics Advance. He also worked closely with members of The Black Mages on Final Fantasy VII: Advent Children, realizing his contributions would have a greater mainstream pull than Hollywood; while most pieces were arrangements of Final Fantasy VII favourites, the composer specifically created new pieces such as “Beyond the Wasteland”, “Divinity”, and “Cloud Smiles” for the film. While he agreed to score Final Fantasy XII, his role was eventually reduced to the theme song; he nevertheless ensured “Kiss Me Good-Bye” was a memorable one, creating a melody he feels is his most beautiful to date and selecting Angela Aki as a vocalist by instinct. Uematsu’s first major client as a freelance was Hironobu Sakaguchi, who asked him to compose a string of titles designed by Mistwalker. On 2006’s Blue Dragon, Uematsu created a diverse but light-hearted score to complement Sakaguchi’s scenario. While he drafted the score on his ancient Roland SC88 — still fearful of more expensive and advanced setups — he worked closely with orchestrator Hiroyuki Nakayama on the gushing setting themes and rock arranger Satoshi Henmi on the blazing battle tracks. The score’s centrepieces included the sentimental vocal ballad “My Tears and the Sky” and a heavy metal boss theme “Eternity” sung by Ian Gillan. His well-received music from the title was arranged for the game’s anime adaptation and two DS titles. The following year, he portrayed the more serious and tragic story of Lost Odyssey with an epic score. He recorded the music with a team of instrumentalists and topped it off with two ballads sung by Sheena Easton. Also on behalf of Mistwalker, Uematsu composed the main theme for Away: Shuffle Dungeon and supplemented Blue Dragon Plus with a new battle theme. He also signed to work on Cry On before it was cancelled. Wanting to make concert productions more common in Japan, Uematsu inspired and organised Press Start: Symphony of Games with four others in 2006. In its series of annual performances, the concert has balanced selections of fan favourites with more obscure selections to celebrate the diversity of today’s video game music. He also continued to make special guest appearances at other concerts, notably the historic More Friends — Music from Final Fantasy, Voices — Music from Final Fantasy, and Extra: Hyper Game Music Event 2007; at the culmination of these concerts, Uematsu even came on stage with The Black Mages to perform hits such as “Advent: One Winged Angel” to unprecedented reception. With producers around the world being aware of his pulling power, Uematsu’s music has also prominently featured on the ensemble tours Video Games Live and PLAY! 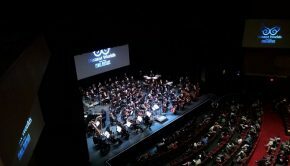 A Video Game Symphony — even creating a bombastic fanfare for the latter — and he has since gone on to make numerous appearances with the series’ world tour Distant Worlds — Music from Final Fantasy; since its debut in Stockholm on December 2007, the composer has worked closely with producer and conductor Arnie Roth to ensure the tour remains fresh and engaging. As a freelancer, Uematsu has also explored other facets of his musicality in a series of unprecedented game scores. For example, he wrote jazz music extensively for the first time while producing the ensemble score for AQ Interactive’s Anata o Yurusanai; his lounge style pieces and smoky vocal themes were a considerable departure from his more marketable Final Fantasy music, but fittingly portrayed the featured female detective. On Square Enix’s Lord of Vermilion, on the other hand, Uematsu created hard rock music to engage listeners in arcades; with its epic main theme and atmospheric arrangements, the project certainly showed influences from Uematsu’s days listening to progressive rock music. For Marvelous Entertainment’s Sakura Note, the composer was obliged by the director to take a more retrospective approach; with the exception of the vocal theme, most of the pieces were reminiscent of Final Fantasy’s Super Nintendo scores with their youthful melodies and humble synth. In other surprising works, Uematsu created the epic main theme of the ensemble score Super Smash Bros. Brawl, which was extensively featured throughout the score, and served as the music director of Kurulin Fusion, spawning electronic arrangements of Bach’s music by Kenichiro Iwasaki. Beyond the realms of game music, Uematsu took the opportunity to score his first complete anime score in 2009, an adaptation of the long-running novel series Guin Saga. Working closely with orchestrators Hiroyuki Nakayama and Tsutomu Narita, the composer carefully adapted his approach to fantasy scoring in order to portray the title’s beautiful scenery and dramatic cinematics. For the first time in his career, the composer recorded the entire score with an orchestra and produced two spiritual theme songs performed by Kanon. In a further work, he composed the theme song for the radio station Minna no Uta with Manami Kiyota. The following year, he commemorated his 50th birthday with his self-published second solo album 10 Short Stories. Liberated from the typical demands of mainstream record labels, Uematsu decided to create a children’s album that reflected his enthusiastic and humorous personality throughout. Working closely with ACE, he created ten pop-flavoured songs and set them to animated videos. Desiring that the music be accessible for international audiences, he recorded the album in Japanese and English, and published the release through CD, DVD, and iTunes. It was another surprising and refreshing work from the ever-popular artist. In his first solo score for the series in a decade, Uematsu created all the music for the initial release of Final Fantasy XIV. The score wasn’t particularly nostalgic to him, given the title was an MMORPG and he had relatively little interaction with the designers. Instead he focused on retaining the fantasy element of the series’ music while offering modern production values. He simultaneously composed the music for Hiroyuki Sakaguchi’s Wii RPG The Last Story. Arranged and programmed by GEM Impact’s Yoshitaka Suzuki, much of the score took Uematsu’s music in a Hollywood-inspired direction. He reunited with Kanon to record the game’s vocal theme “The Flying One” and subsequently inspired her studio album A New Story, blending spiritual compositions with Final Fantasy arrangements. In smaller roles, Uematsu penned inspiring themes for various productions — spanning the video games UnchainBlades ReXX and Jyuzaengi, to the animation Fairy Tail and charity album Play For Japan — and served as a music producer for Lord of Arcana and Lord of Apocalypse. Continuing to be closely involved with Distant Worlds, he also participated in the piano tour Benyamin Nuss Plays Uematsu and the orchestral concert Symphonic Odysseys. In 2010, Uematsu also founded the five-man rock band Earthbound Papas to pursue independent studio and live activities. The band debuted with Uematsu’s dream rock-orchestral rendition of Final Fantasy VI’s “Dancing Mad” on the studio recording Distant Worlds II and subsequently recorded their debut album Octave Theory, mixing progressive rock compositions with arrangements of Uematsu’s scoring highlights. The members have gone on to make numerous live appearances, notably on Dog Ear Records’ semi-annual concert events, Japan’s Fantasy Rock Festivals, and Washington D.C.’s MAGFest X. Impressed by the diverse skills and backgrounds of the Earthbound Papas’ members, Uematsu has also scouted the band for entire game scores. Under the direction of Uematsu, the band went on to compose and arrange the music for the multifaceted UnchainBlades ExxIV and light-hearted Hyperdimension Neptunia Victory. 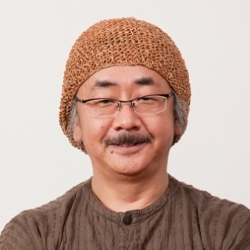 After a long development, Uematsu’s latest game project Fantasy Life was released at the end of 2012, filled with light vocal pieces. The artist is also currently writing the theme song for NORN9 while juggling ongoing concert appearances. Throughout his 25 years in the industry, Uematsu has evidently made a connection with gamers through his heartfelt melodies and his music continues to be enjoyed by millions. © Biography by Chris Greening (June 2011). Last updated on March 18, 2013. Do not republish without formal permission. Posted on March 18, 2013 by Chris Greening. Last modified on March 21, 2014.